Heat oil in a large skillet over medium-high. Season pork chops all over (including the fat cap) with salt and pepper. 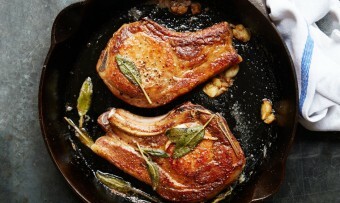 Cook pork chops until bottom side is golden brown, about 1 minute. Turn and cook on other side about 1 minute before turning again. Repeat this process, turning about every minute, until chops are deep golden brown and an instant-read thermometer inserted into the thickest part registers 135°, 8–10 minutes (cooking time will depend on thickness of chops). Remove pan from heat and add sage, garlic, and butter, smashing garlic into butter. Tilt skillet and spoon foaming butter and drippings over pork chops, making sure to baste the fat cap. Transfer pork chops to a cutting board and let rest at least 5 minutes (pork will come to 145° as it sits). Serve with any juices from the cutting board spooned over top.